Cafe de l'Atlas, Guëliz where you can enjoy a cold beer - inside! Even though Morocco is a Muslim country, does not mean that those of us that like a good pint of beer have to stay on the "wagon." There are domestic beer available at reasonable prices. Beer production is relatively new to Morocco as it was introduced by the French as late as the 20th century. Today, Société des Brasseries du Maroc oversees the production and distribution. In many Muslim countries alcohol consumption is severely restricted or even banned. Not so in Morocco, but you have to know where to get it. First and foremost - ordinary cafés or bars do not server beer or wine, but coffee, mint tea, juices or mineral water. There are a few exceptions. 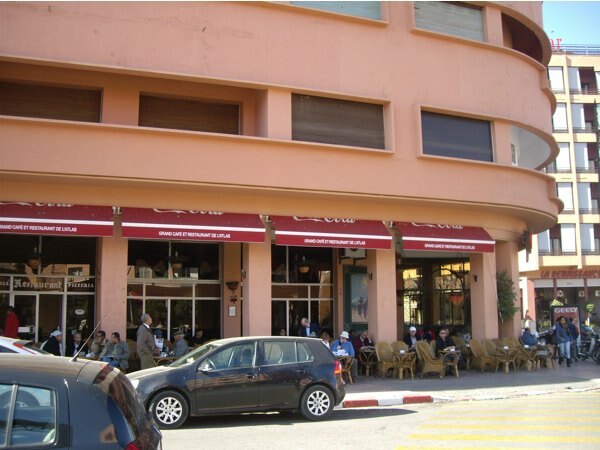 In the Medina you can get alcoholic beverages in Café Arabe and in Guëliz you can get wine, beer and spirits at Grand Cafe et Restaurant de l'Atlas. The latter has a grand name, but that is it! I said outside and ordered a beer, but was immediately asked to move inside, if I expected to get a cold beer. The air inside was thick with Morrocan tobacco smoke, and the clientèle looked rather scruffy, compared to those drinking their coffee outside. I was served a cold bottle of Bière de Prestige, a good pilsener style brew - perfect to quell you thirst in the hot weather. 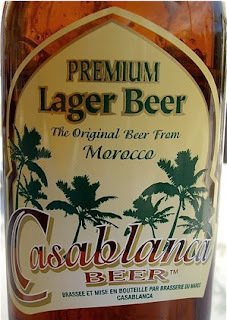 This was one out of two domestic brews I tasted during my Moroccan vacation. The second was a lager manufactured in Casablanca, and bearing the name of this major Moroccan city. I enjoyed it to a delicious meal at Villa Flore, an enclosed Riad and exclusive restaurant within the Medina. 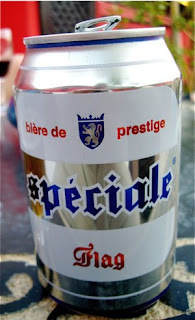 It was a little darker and had more character than the light Bière de Prestige, that is a more suitable to drink as a refreshment.